Fort Teran, Texas and buried treasure in Money Hill. Hidden deep in the woodlands bordering the Neches River are the last remains of what may be the earliest fort built in East Texas. And, perhaps, a buried treasure. Unlike the forts Texas built to protect settlers from Indians, Fort Teran was established by Mexico in 1831 to control the flow of smugglers and illegal immigrants into Texas. The site was sometimes referred to as the "pass to the South." Three important trails -- the Coushatta Trace, the Alabama Trace and the Nacogdoches-Oroquisac road --crossed the Neches River near where the fort was built, underscoring the significance of the site. The fort was named for General Manuel de Mier y Teran, commandant general of the eastern division of Mexican Texas. Teran made an inspection tour of Texas in 1829 and observed that Americans were sneaking into Texas by using the Indian trails. When he returned to Mexico, he helped draft a law in 1830 forbidding Americans from settling in Texas. The responsibility for enforcing the law was assigned to Teran, as a director of colonization, and his program included the construction of garrisons on the Neches and several other East Texas rivers. Peter Ellis Bean, a colonel in the Mexican army, was chosen to build Fort Teran. He left Nacogdoches for the Neches River on September 25, 1831, but work on the fort moved slowly. When the garrison was finally finished, it had ten wooden cabins to provide housing for Bean and his troops. The site in what is now Tyler County lies about three miles west of Rockland on the river's south banks. The river crossing provided access across the Kisatchie Wold, a ridge running from the Mississippi River to the Rio Grande valley. At the time, the ridge was considered a formidable obstacle to travel for north-south travel. 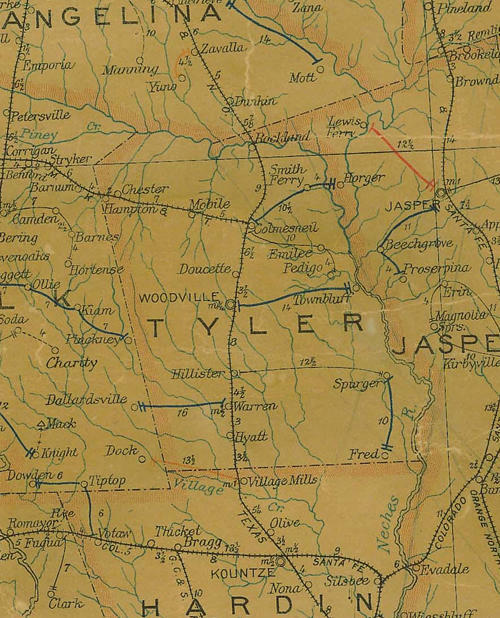 In northern Tyler County, the ridge reaches heights of 400 to 450 feet above sea level at several peaks and has forced the Neches to run eastward along the county's northern boundary. Fort Teran was abandoned when the Mexican government found it was unable to support its Texas forts adequately. In 1834, the last of the Fort Teran troops were transferred from the river, leaving about a dozen civilians at the site. Samuel T. Belt opened a trading post and a post office functioned there between 1856 and 1866. Steamboats used the river until the railroads came to East Texas in the 1880s. A ferry also operated at the site. It was known at different times as Belt's Ferry, Boone's Ferry and Duncan Ferry. When a highway was completed east of the site in 1917, the ferry went out of business. Fort Teran today is both difficult to find and controversial. A logging road leads to the site and a state historical marker erected during the Texas Centennial in 1936 stands on a bluff known as Money Hill. The site was named because of rumors that Mexican troops had buried in the river's mud a cannon filled with gold coins. Another story claims the fortune was hidden in a cave excavated in the river banks. A more reasonable explanation is that the cave was only a salt mine. In recent years, there has been some speculation that the Centennial monument may have been placed at the wrong place on the river, perhaps even in the wrong county. Decades ago, a Lufkin historian wrote that Fort Teran really stood on the north bank of the Neches in Angelina County. I was going to recommend you add one of Bob Bowman's write-ups to your 'Texas Treasure Hunting' link, then realized it's probably already there. Bob was solid...never met him unfortunately, but we are from the same town. Have a few of his books.